A country that is so rich in arts, culture and heritage, which has contributed so much to mankind right from the zero to medical innovations during the Charaka period to arts and architecture to engineering from the Chola period to Tanjore paintings that involve a lot of technical intricacies, has not contributed anything substantial in the last whole century. We have the brightest minds, an array of academic institutions, exposure to the globe and the resources needed to innovate. Despite all that, India lacks Innovation…. Why? Right from schools to colleges, asking questions is termed as ‘disobedient’ and the entire thought process is tailored to accept whatever is told. When a student thinks out of the box, the teacher handles it with an iron-fist approach and labels the kid ‘disobedient’ and in many cases ‘thinks too much about himself’. We need to change our perception of respect and obedience. Although it is present in our ethos, we need to accept a ‘questioning mind’ and nurture it in order to promote research & innovation. A corrupt and chaotic governance spoils the route to innovation. The Intellectual Property of India is notoriously famous for its bidding process of recruitment of absolutely unskilled people for the job. No surprises about the fact that there is a major barricade on the road to innovation. When a research scholar goes to the IP office with a proposal, the bureaucrat at the office premises is one that came to that position through political influence or by paying a hefty bribe for want of a ‘Government job’ and has no clue of what to do. This demotivates research scholars to such an extent that they prefer switching careers as ‘Technical Consultants’ for MNCs and start minting money with their wonderful ideas which are basically Indian but given ownership to elsewhere. While the schools have standardized their examination system, colleges still have the old-fashioned essay type answers. Where is the scope to innovate with this kind of knowledge testing mechanism? Venture capital firms are just picking up. The very few ones favor projects recommended by influencers among the Capitalist groups or Political groups. A transparent funding mechanism is needed to streamline R&D which is the soul of innovation. The typical Indian attitude towards failure is another major handicap. When one venture fails in a particular domain, it is looked upon as a major issue and it blocks the way for even troubleshooting what went wrong in the venture. The best innovations happen after a dozen disasters and the Indian mind cannot even understand this concept. Everything including the media has become a paid industry. We get to hear only paid news and that sidelines even the most genuine happenings in the realm of technology. The Educational Institutions and Research Academies have no schemes to stimulate scientific temper and the quest to innovate. The Government of India makes so much of noise for National awards for films, arts, sports etc. but when it comes to research, the importance given to it is so trivial. We needn’t be like Norway or Sweden and we cannot be. But, we could at least accommodate scientific research as a key area to play a role in the International community. For all the talent that we have and the resources that we are blessed with, we could position ourselves in a much better way provided we give innovation it due share of recognition. "Lack of Innovation in India Inc.? 5 probable reasons…", 5 out of 5 based on 1 ratings. Sai Sundhar Padmanabhan, a Business Analyst and a Classical vocalist from Chennai writes about Technology, Trends, Arts and social media which are his primary areas of interest. ‘Return Guaranteed’ – Indian E-commerce and the issue of Reverse Logistics! Excellent.Jealousy ,infighting etc. 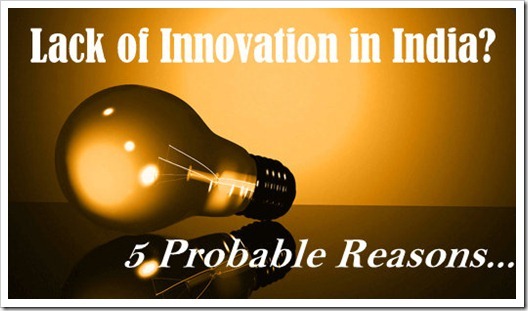 are some of the reasons for lack of innovations in organisations. A well thought out article on innovation. It goes to prove that the Indian environment is non-conducive for individual, independent innovators. We are conditioned to think and act in a certain way and not to question established norms. Invisible innovation is happening now, but being a recent phenomena, it will take time for it to rub off on mainstream thinking. @ sai i think it is the reality what you have wrote ,probably i do agree with you ,.now the question remains how we could eliminate these things…as you know that every one in every city of india wants to be best by getting stand on his own feets…as like the guys myself, i want to do big things in my city kashmir ,but no body supports me ..neither govt nor society ,.,,everyine responds in pesamistic mode….dont know what to do with this hell ……..
Great to see some ambitious people like you. By ‘big things’ what exactly do you mean? Setting specific goals that are clearly defined along with a timeframe is very importent to realize them. To look out for support from society is futile considering the kind of society we live in. May be we can try to get acceptance by showing extraordinary merit. One of my favorite quotes from Oprah Winfrey is “Excellence gets you noticed” and no matter what the society is. Good luck. Chase your dreams sincerely till you reach them. That means you will reach them for sure. I really appreciate the fact that you have big dreams. But being specific about them and setting a timeframe for it is equally important. In any society, excellence gets noticed. So, it is very important to sincerely work towards excellence and that makes nothing impossible. Great, focused, and well written thoughts and facts! India really needs platform for innovation and due support for researchers to value their ideas. VALVE SOLUTIONS startup B2B digital marketing wins "Share your success story" contest at Linkedin B2B Connect 2012, April 2012, Mumbai….read here….http://amruthatechnologies.blogspot.in/2012/04/valve-solutions-winners-of-share-my.html. A well written article – although I must say that I didn’t see what I thought was one of the top reasons for all problems ;-) … “The lack of passion”. A passionate teacher would encourage questions; A passionate politician would be more interested in bringing about changes. A passionate parent would encourage their child towards knowledge (than scoring marks) and kindle a fire in the child towards other streams than engineering and medicine. A passionate startup will learn lean methods leading to succesful businesses. A passionate citizen will keep themselves and their surroundings clean. A passionate congregation of prooud citizens will raise the country to global standards. Can we call it the Indian dream?